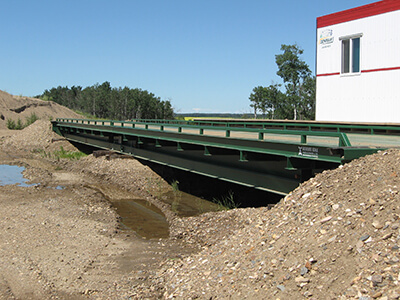 Truck Scales - Accurate Scale Industries Ltd. ACCURATE SCALES MANUFACTURES AND DISTRIBUTES A LARGE ASSORTMENT OF SCALES, MEASUREMENT SOLUTIONS AND ACCESSORIES. PLEASE CONTACT US AT 800-252-7528 AND WE’LL HELP YOU FIND EXACTLY WHAT YOU NEED. The Eliminator is a truck scale with built in side rails. 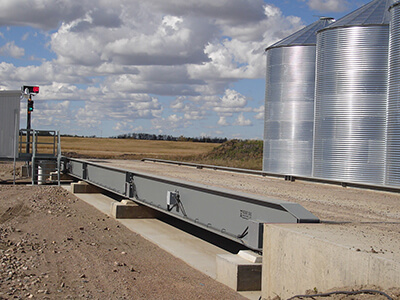 Because of its design, it doesn’t require a pit, making it a very cost effective solution. 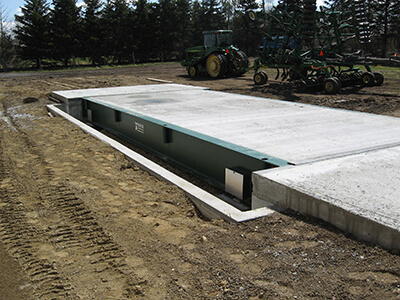 The above ground construction with minimal foundation requirements makes it easy to install and service. This vehicle scale comes with either a concrete or steel deck and comes in a variety of sizes to suit your application. Manufactured by Accurate Scale and made in Canada. Our Flush Deck (flat top) Eliminator offers a flush deck that is 1-1/2 feet wider than our Raised Deck Eliminator. A pit is not required and foundation requirements are minimal. Its cost-effective and maintenance-friendly design combined with a wider surface make this a very popular option. Manufactured by Accurate Scale and made in Canada. Our portable truck scales are completely self-contained, have minimal foundation requirements and feature a low-profile design, making them easy to set up or move to wherever you need a portable vehicle weighing solution. There is no pit required, just a concrete or wood timbers base. All of our scales are legal for trade and are built with high quality steel. They are designed for long-lasting durability and superior performance. The scales feature easy access to the load cells, which makes future service calls quick and efficient. Our scales also come with man way access hatches for easy cleaning and come in custom lengths and widths. We also stock accessories such as portable scale shacks, programmable weigh indicators, traffic light control systems, and software. Manufactured by Accurate Scale and made in Canada. 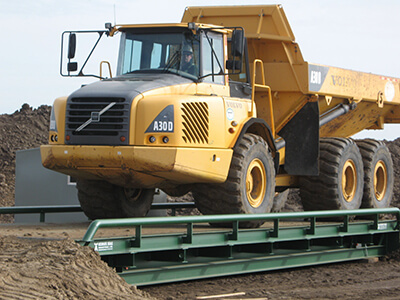 Our portable rock truck scales are built and designed to accommodate even the largest articulating trucks. They are manufactured with very heavy main beam steel so they can perform with the highest degree of accuracy even under the harshest conditions. Having a few different portable designs to choose from we can supply a scale tailored to exact requirements. Manufactured by Accurate Scale and made in Canada.